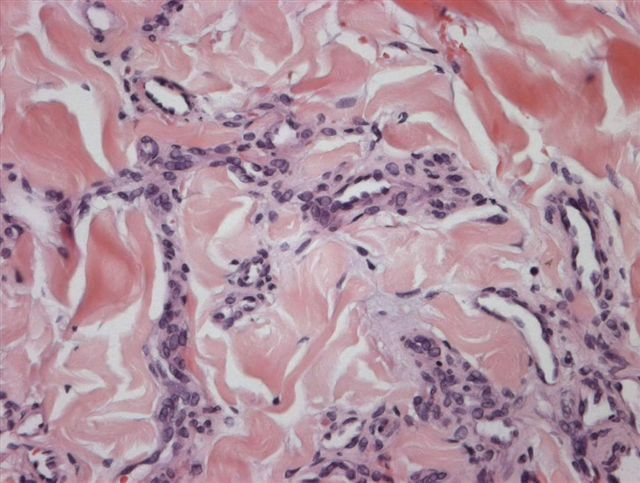 These cases can also be accessed by clicking on the Case of the Week button on the left hand side of our Home Page at www.PathologyOutlines.com.� This email is sent only to subscribers.� To view the images or references, you must click on the links in blue. To subscribe or unsubscribe, email info@PathologyOutlines.com, indicating subscribe or unsubscribe to Case of the Week.� We do not sell, share or use your email address for any other purpose.� We also have emails for new Pathologist jobs (biweekly), new Laboratory but not pathologist jobs (biweekly), website news (monthly), new books (monthly), and a newsletter (twice a year).� You must subscribe or unsubscribe separately to these email lists. In response to many inquiries, we will never charge our users or require registration for PathologyOutlines.com.� We believe the Internet should be free to all, and in fact, are trying to convince more pathology journals to make their content �free full text� without registration, at least for the older issues.� We recently started to emphasize references to journals with free full text-no registration, which are highlighted in green. Share your tips on using PathologyOutlines.com by entering our Contest (click on the Contests button on the left side of the Home Page) to win $50 for the best tip. We thank Dr. Alia Albawardi, Faculty of Medicine & Health Sciences, United Arab Emirates University (UAE), for contributing this case and some of the discussion. 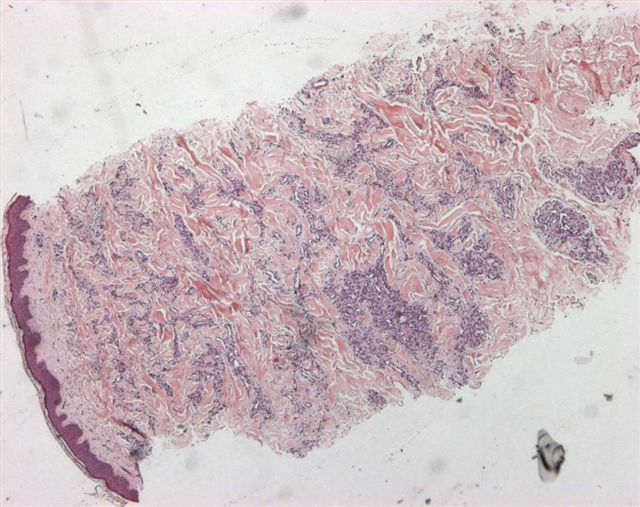 We invite you to contribute a Case of the Week by emailing info@PathologyOutlines.com with microscopic images (any size, we will shrink if necessary) in JPG format, a clinical history, your diagnosis and any other images (gross, immunostains, EM, etc.) that may be helpful or interesting.� We will write the discussion (unless you want to), list you as the contributor, and send you a check for $35 (US� dollars) for your time after we send out the case.� Please only send cases with a definitive diagnosis. A 28 year old man had a red nodule on the left thigh for 6 months that was slowly growing.� The clinical suspicion was Kaposi�s sarcoma. Microvenular hemangioma was first described by Hunt in 1991 (J Cutan Pathol 1991;18:235).� It is rare, with less than 50 cases reported.� It presents as a slow growing, solitary, asymptomatic, purple-red papule or plaque in young to middle-aged adults, often on the trunk or limbs.� The histology shows a dermal proliferation of small, irregular branching capillaries and venules with inconspicuous lumina.� Endothelial cells may be plump, but no atypia is present.� The stroma is collagenous.� No spindle cells are present. The endothelial cells are immunoreactive for CD34 and Factor VIII related antigen.� Smooth muscle actin highlights pericytes surrounding the endothelial cells. 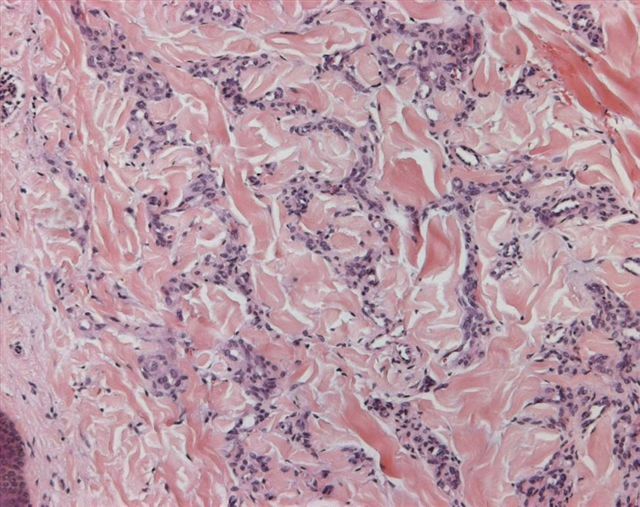 Kaposiform hemangioendothelioma also has slit-like lumina, although they are due to nodules and sheets of compact spindle cells.� It affects the skin or retroperitoneum of infants and children, and may be associated with severe coagulopathy. Microvenular hemangioma is a benign lesion.� To date, excision appears to be curative.